Livestock judging involves carefully evaluating a class of animals—such as steers, sheep, and swine—and then rating them against commonly accepted standards. The student then gives oral reasons regarding his or her placement of the animals within the class. Through the program, students learn teamwork, effective communication skills, and leadership skills. Fort Scott Community College has one of only a few indoor community college livestock arenas in Kansas. Arnold Arena hosts a variety of events including rodeo events, livestock judging practices, judging camps, and other agriculture workshops. 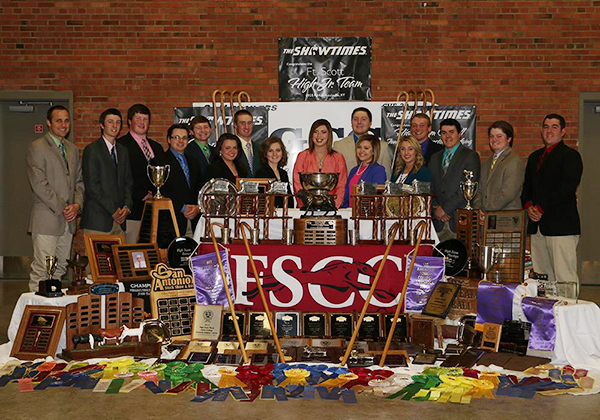 The Fort Scott Community College Agriculture Department will host its annual livestock judging camps in June. A beginners’ session for younger students will be offered from 9:00 am to 4:00 pm on Tuesday, June 19, and an extended session for older students will begin at 1:00 pm on Wednesday, June 20 and end at 11:30 am on Friday, June 22. During both sessions, students will learn how to evaluate livestock and provide oral reasons in a fun learning environment. Students will learn transitions and phrases used during livestock judging, and they will be encouraged to improve on every set of reasons. Upon completion of the camp, students will be more comfortable with judging livestock and presenting their oral reasons. The fee for the beginners’ session is $50 and the extended session is $175. To download the registration form, click here. For more information, please contact FSCC Livestock Judging Coach Blake Davis at at 620-223-2700, ext. 3290.